In statistics, cluster sampling is a sampling method in which the entire population of the study is divided into externally homogeneous but internally heterogeneous groups called clusters. Essentially, each cluster is a mini-representation of the entire populationStatisticsStatistic is a term that is derived from the Latin word “status,” which means a group of figures that are used to represent information about a human. After identifying the clusters, certain clusters are chosen using simple random sampling while the others remain unrepresented in a study. After the selection of the clusters, a researcher must choose the appropriate method to sample the elements from each selected group. There are primarily two methods of sampling the elements in the cluster sampling method: one-stage and two-stage. In one-stage (cluster) sampling, all elements in each selected cluster are sampled. On the contrary, in two-stage (cluster) sampling, simple random sampling is applied within each cluster to select a subsample of elements in each cluster. The cluster sampling method must not be confused with stratified sampling. In stratified sampling, the population is divided into the mutually exclusive groups that are externally heterogeneous but internally homogeneous. For example, in stratified sampling, a researcher may divide the population into two groups: males vs. females. Conversely, in cluster sampling, the clusters are similar to each other but with different internal composition. 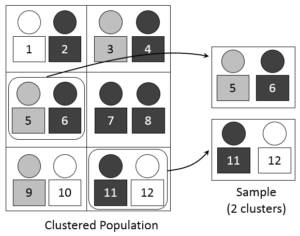 Since cluster sampling selects only certain groups from the entire population, the method requires fewer resources for the sampling process. Therefore, it is generally cheaper relative to the simple random or stratified sampling as it requires fewer administrative and travel expensesSG&ASG&A includes all non-production expenses incurred by a company in any given period. This includes expenses such as rent, advertising, marketing, accounting, litigation, travel, meals, management salaries, bonuses, and more. On occasion, it may also include depreciation expense. The division of the entire population into homogenous groups increases the feasibility of the sampling. Additionally, since each cluster represents the entire population, more subjects can be included in the study. Cluster sampling is prone to biasesSample Selection BiasSample selection bias is the bias that results from the failure to ensure the proper randomization of a population sample. The flaws of the sample selection. If the clusters that represent the entire population were formed under a biased opinion, the inferences about the entire population would be biased as well. Generally, the samples drawn using the cluster sampling method are prone to higher sampling error than the samples formed using other sampling methods.